In an effort to bring transparency to the NIPS 2016 reviewing process, we describe in this page the main steps and the new features we implemented. This is the result of the joint effort of the program chairs (Ulrike von Luxburg and Isabelle Guyon) and the program team (Krikamol Muandet and Behzad Tabibian, partly also Rohit Babbar). We are most grateful to our 100 Area Chairs and the 3400 Reviewers for all their input and support. We are much indebted to Neil Lawrence for sharing his scripts from the NIPS 2014 conference (documented in his blog). Thanks also to the NIPS Board for their input, though they may not endorse everything we did, and the CMT support team. Last but not least, thanks to all the 6000 authors who contributed their time to prepare alltogether 2500 papers for this year's NIPS. We hope to see many of you at the conference! Inventing new procedures that will scale with the ever-growing numbers of submissions. We asked the NIPS Board and all ACs of the last two NIPS conferences to nominate potential ACs for this year. In this way, we covered the whole variety of NIPS topics, and obtained qualified suggestions. We obtained around 350 suggestions. We asked the NIPS Board to go through the list of suggested ACs to vote in favor of suggested ACs. We accounted for the distribution of subject areas of submitted papers of the previous NIPS conference. Combining all this input we compiled a final list of ACs, by the end of January we had recruited exactly 100 ACs. In a later step, we formed "buddy pairs" among the ACs. Based on the ACs preferences, each AC got assigned a "buddy AC". These buddy teams were important in the decision process (see below). Invited Experienced Reviewers: We asked all ACs to suggest at least 30 reviewers each who have completed the PhD degree. We obtained 2500 suggested experienced reviewers. We invited all of them, and 1100 accepted. We then asked all confirmed reviewers to "clone themselves" by inviting at least one researcher with a similar research background and at least as good qualification as themselves. This resulted in another 500 experienced reviewers. 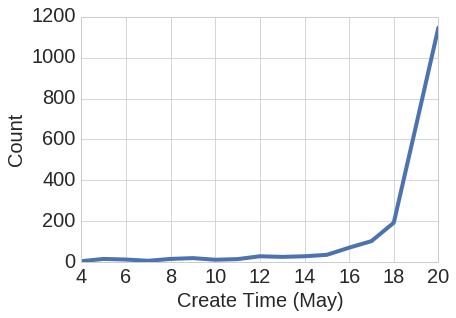 Volunteer Author-Reviewers: An obvious procedure to let the number of reviewers scale with the number of submissions is to ask authors to become reviewers as well. This idea has been used in the past, for example to evaluate NSF grant proposals or to allocate telescope time. To implement this idea, without constraining unwilling authors, we requested authors to volunteer during the submission process by naming at least one author as "volunteer reviewer". We ended up with 3000 nominations. The next day we invited all of them formally through CMT, and about 2000 of the volunteers accepted the invitation and were involved in the review process. One of the nice effect of including author-reviewers was to add transparency to the review process as at least one author per paper experienced it. The deadline was strictly enforced, regardless of personal situations, we are sorry for those who missed it. During the next couple of weeks, a number of papers were withdrawn or deleted by the authors (for example, because they had been submitted twice, or remained unfinished at the time of the deadline). By the end of the review process, we were left with 2406 submitted papers. A first similarity score between all ACs and all submitted papers was computed based on subject areas and the Toronto paper matching scores. Additionally, ACs could bid for papers they wanted to handle. Then papers were assigned automatically, taking into account the similarity scores and the bidding scores. Finally, ACs could decline handling certain papers for miscellaneous reasons, including conflicts of interest. These papers were re-assigned by hand by the program chairs. The AC of each paper was responsible to first assign one senior, highly qualified reviewer "by hand" (either from Pool 1 or at the discretion of the AC). Two more invited reviewers (from Pool 1) were assigned automatically to each paper, using a combination of subject similarity, reviewer's bidding preferences, and similarity scores computed by the Toronto paper matching service. Three volunteer reviewers (from Pool 2) were assigned automatically to each paper by a similar procedure as in Step 2. The ACs were asked to check whether each of their assigned papers had at least 3 really competent reviewers, and could manually change reviewer assignments (either from Pool 1 or at their discretion) to ensure that this is the case. During the decision process, additional "emergency reviewers" were invited to provide complementary reviews if some of the reviewers defected or no concensus could be reached among the selected reviewers. We also asked the reviewers to flag "fatal flaws" and declare their overall "level of confidence". The scores had to be complemented by justifications in designated text boxes. The following histograms show the distribution of average scores for all papers (where the average is taken over all reviews for each paper). The ACs were given a lot of flexibility to use the scores. In particular, the decisions were not based on thresholding an overall score (we did not even attempt to compute such an overall score). The text explanations in the reviews, the rebuttal, and the discussions among reviewers played an important role. Once most of the reviews were in, all authors had the possibility to look at the reviews and write a rebuttal (some reviews were still missing at this point, but it would not have helped to delay the rebuttal deadline, the missing reviews trickled in slowly). Subsequently, area chairs and reviewers engaged in detailed discussions about the pros and cons of the submitted papers. To support the ACs, we sent individual reports to all area chairs to flag papers whose reviews were of too low confidence, too high variance or where reviews were still missing. In many cases, area chairs recruited additional emergency reviewers to increase the overall quality of the decisions. No conference calls between ACs and program-chairs: we introduced a decentralized, scalable decision process relying on AC buddy-pairs. No poster spotlights. Instead we doubled the number of oral presentations by introducing two tracks. The decision process was largely based on AC "buddy" suggestions. The first round of decisions happened in a moderated, but decentralized fashion: each area chair worked with her/his "buddy". The two of them were responsible for all papers in their joint bag, and made their decisions jointly, following guidelines given by the program chairs. Difficult cases were taken to the program chairs (among them, cases conflicts of interest and plagiarism). To harmonize decisions across buddy pairs, all area chairs had access to various statistics and histograms over the set of their papers and the set of all submitted papers. In a second round, the program chairs consolidated the decisions. This mainly affected the selection of oral presentations, with the goal to exhibit the diversity of NIPS papers and to expose the community with novel and thought provoking ideas. All in all, 568 papers got accepted to the conference, among them 46 oral presentations. Below is a plot of the distribution per subject areas (combined primary and secondary subjects), both for submitted papers and for accepted papers. Of course the proportions are not identical, but the plots do not show any systematic bias in favor or against certain areas. (Application) Collab. Filtering / Recom.Sys. With a review process of this scale it is unavoidable that among the rejected papers there are hidden gems that simply drowned in the review process. For this reason we organized an exhibition of rejected papers, in a spirit similar to the Salon de Refuesés. In this exhibition, you can find a list of those rejected NIPS submissions whose authors decided to take part in the exhibition.